Friedrich Nietzsche leads a gaggle of beauty queens in a riot within a budget hotel room; a man avenges the death of his Brussels Griffon on the streets of Nagoya, Japan; and a puppeteer attempts to resurrect the art of prank calling. These stories create the surreal and fast-paced live-action comic book Let’s Prank Call Each Other. 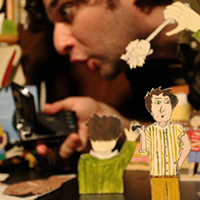 Puppeteer Zach Dorn narrates these original tales as digital cameras are manipulated through cardboard streets and overhead projectors illuminate silhouettes. With multiple streams of media for his puppetry, the set looks like a deck at NORAD, rather than a stage at Fringe. With some many modes, I wondered how he’s going to be able to navigate through them all to deliver a smooth and refined package. The presentation looks fractured at multiple points, leaving the collective un-cogent. There is great potential here for a visually stunning show but he’s too ambitious in what he can juggle. There’s no discernable plot to the story, leaving a miscellany of video technology.